Butterfly Weed. Asclepias tuberosa L.
Pleurisy-root, Canada-root, Indian posy, orange-root, orange swallowwort, tuberroot, whiteroot, windroot, yellow or orange milkweed. Butterfly weed flourishes in the open or in pine woods, in dry sandy or gravelly soil, usually along the banks of streams. Its range extends from Ontario and Maine to Minnesota and south to Florida, Texas, and Arizona but it is found in greatest abundance in the South. This is an erect showy plant from 1 to 2 feet high. 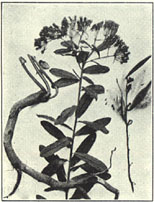 The stems are stout and hairy, sometimes branched near the top and bearing many lance-shaped, rather rough leaves from 2 to 6 inches long. The flower clusters which are borne at the ends of the branches consist of numerous oddly shaped orange-colored flowers. The plant is in flower usually from June to September, followed late in the fall by pods from 4 to 5 inches long containing the seeds with their long silky hairs. This plant, unlike the other milkweeds, contains little or no milky juice. The root is large, branching, white, and fleshy. The roots of the common milkweed, Asclepias syriaca L., which occurs in fields and waste places from Canada to North Carolina and Kansas, and the swamp milkweed, A. incarnata L., found in swamps from Canada to Tennessee and Kansas, are also used to some extent. Both of these species contain a milky juice. The former has pinkish-purple flowers, while those of the latter are flesh or rose colored. The roots of the several species, collected in autumn. prev: Burdock. Arctium minus (Hill) Bernh. next: Butternut. Juglans cinerea L.